Spoof URL looks secure (https), but is not. 4. Website traced to Indianapolis, USA. 5. Spoof website appears not malicious and was hosted on a hijacked server.
" 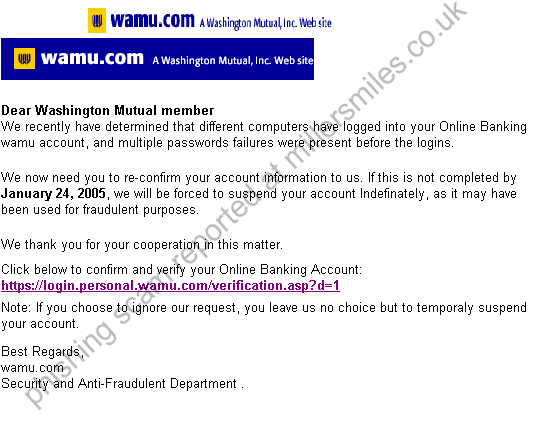 We recently have determined that different computers have logged into your Online Banking . " "If you were sent to this address by an e-mail, you have been scammed by some one trying to steal your credit card info. We are a victim of this attack as well, and not affiliated with the Russian scam artist whose IP address is ppp83-237-43-218.pppoe.mtu-net.ru and who illegally hacked into this server and uploaded a malicious file. "